I'm an Associate Professor of Animation at Middle Tennessee State University. I've been teaching at MTSU for six years now and about 14 years total at the collegiate level. I teach classes involving modeling, texturing, lighting, rigging, animating, rendering, and compositing. I also teach two senior capstone courses where students make an animated short film and their marketing materials to assist them in their job search after graduation. Officially, my first job was painting houses (inside and out) starting at the ripe age of 14. Both of my parents were high school teachers, so they were paid quite handsomely! But my dad said, “I want to be swimming in money!” and would paint houses in the summers for supplemental cash. I joined him for every summer until my second year in grad school. I received my B.A. from the State University of New York (SUNY) at Geneseo, in Geneseo, NY where I double majored in Mass Communication with an emphasis in Mass Media Production, and Studio Art where I concentrated in Computer Art and Ceramics. I received my M.F.A. in 3D Computer Animation from Rochester Institute of Technology in the School of Film and Animation. I was introduced to ACM SIGGRAPH and the conference by my former professor from graduate school, Mara Schweppe. I had no clue about it. 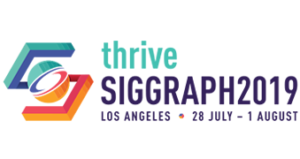 I attended my very first SIGGRAPH in 2001. I was immediately hooked. I was so amazed and inspired, I used leftover loan money to attend the following year in San Antonio. After becoming an educator myself, I only attended sporadically when funds were available. I wanted to get involved, but I never really knew how. 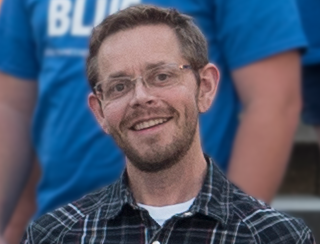 It wasn’t until I joined the faculty at Middle Tennessee State University did I meet my now colleague, Marc Barr. He introduced me to the Education Committee and said, “just show up” to the meeting. I showed up eager to do anything, including sweeping floors. The following year I was the new Education Committee Booth Manager. I’m also the curator for the Faculty Submitted Student Work Exhibit sponsored every year by the Education Committee. Being involved in the committee and conference was one of the best decisions I ever made. For this, I will be forever grateful to Marc. He’s usually pretty humble, so hopefully this makes him blush a little. I have had so many great memories at SIGGRAPH. One that sticks out to me is a story I that I tell my students. I was in the audience for a DreamWorks Animation talk on the use of color in "Kung Fu Panda 2." As one of the speakers was illustrating how color helped drive their story, it dawned on me. I should be doing that with my own in-progress film! I, of course, teach those same concepts to my students, but I wasn't practicing what I was preaching. It took hearing it from someone else, and in an inspiring way, for it to click within me. Attending that panel and others like it lit a new flame inside me and motivated me to finish my film. It helped bring the excitement back that I was slowly losing. I’m currently attempting to work with UNOS (the United Network for Organ Sharing), a “private, non-profit organization that manages the nation’s organ transplant system under contract with the federal government.” I want to create an animation to help illustrate to pediatric patients that need an organ transplant what it’s like to go through the process from the very beginning through post transplant. As a three-time kidney transplant recipient, I have had nearly 40 years of firsthand experience. With my talents as a storyteller and animator, it just seems like a natural fit. I remember how uninformed and scared I was as a ten year old going through my first transplant. I want to make sure no other child has to go through what I went through. I want to give back. Without hesitation, I can confidently say I would love to have dinner with “Weird Al” Yankovic. I began to idolize him and his music as a child in the 80’s and my love for him has only grown. His music is clever, funny, catchy and he does it all without being vulgar or insulting. His ability to adapt and change with the music industry, while still remaining relevant, is a testament to his intelligence. He is also one of the most notoriously honest and likable people in the entertainment industry. I would love to sit down with him at a meal (vegetarian of course) and express to him how much he and his music has meant to me and how it has shaped my growth as an artist and a person. I can make tooting noises with my hands and play songs. I take requests. My parents have been my rocks throughout my life. Through the good and bad, they’ve both kept me smiling. It’s from them I learned how to laugh, love and (try?) to be a good human being. There have been a few people along the way who have influenced me and my ACM SIGGRAPH journey. Marla Schweppe and Marc Barr started me on my paths. The wonderful folks I work with on the Education Committee have keep that passion for the organization, conference, and committee alive. Probably the proudest achievement of my career was creating and being the advisor of our MTSU ACM SIGGRAPH Student Chapter at our university. I began the arduous process with one of my students, and first president, Justin Wright. It took the better part of the year to be approved and chartered by our school and by ACM/ACM SIGGRAPH. The fall of 2012 was our first official semester as a chapter. Through a lot of hard, time-consuming work, our chapter slowly began to grow. I preached the value of the chapter, the organization and the conference every chance I got. Slowly but surely, our enrollment grew and students started to see the light. We now have great attendance at all our meetings and more students have attended the conference with me every year since. In addition to helping their future careers with the chapter, I’ve somehow managed to build a community within our animation program and our chapter (which I consider one in the same), where compassion, respect and helping your fellow animators is the way of the land. My students found a place where they belong and don’t feel judged. But the TRUE moment, however, came a few years ago. I was having an officer meeting recapping the past year on what chapter events worked and which ones could be improved. One student started talking about how much being a part of the chapter had meant to him. Another officer piped in and said that since joining our chapter, she didn’t need her depression medication anymore. I was blown away. But then a second student said he didn’t need his depression medication either. And then a THIRD student said she didn’t need hers! I was speechless. I nearly broke down in tears. That was the moment I knew I was actually making a difference.